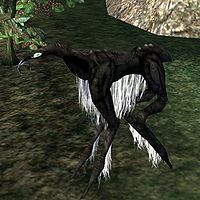 The mainland of Morrowind is full of natural creatures, some of which can be found on the island of Vvardenfell and some of which never made it over the Sea of Ghosts. This is a list of all creatures exclusive to the mainland. 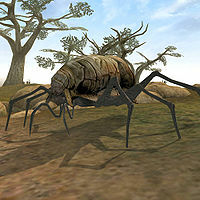 A common tailless two-legged creature found in the grasslands and ash wastes of Morrowind. 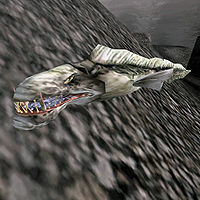 It is similar to its more powerful cousin, the Kagouti, and resembles a disproportionately large walking mouth. For a list of Alit defined in the standard game, see this page. 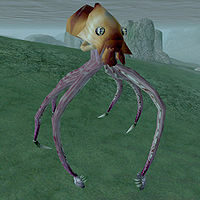 Cephalopods are large, sea-dwelling molluscs with six legs and a body protected by a tough shell. The shells are prized trophies among fishermen and shipmasters. They're often kept as good luck charms by the superstitious seafarers. Those of a more practical mind will appreciate it for its useful effects in the hands of a skilled alchemist. 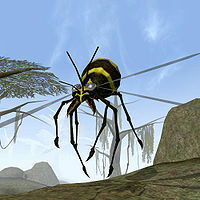 They are aggressive and can be found in many locations around the mainland. 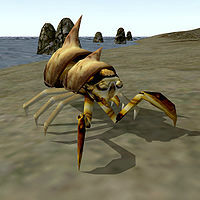 Only minimal information about crabs has been collected at this time. More information is being gathered, however and will be added as soon as it can be integrated into the whole. 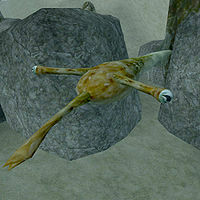 Sea Crabs are a variety of crustacean. 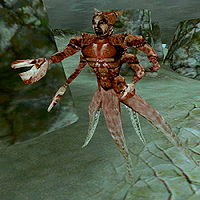 They appear to be only marginally related to Mudcrabs and Mole Crabs. 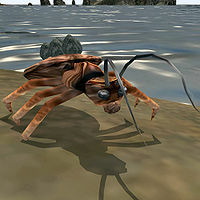 They are hostile and can be found in many locations across the mainland's beaches and oceans. They have a habit of triggering battle music and being very hard to find at the same time. This is mainly because they can travel between land and water. Molecrabs are another species of crustacean. They appear to be related to Mud Crabs although not Sea Crabs. 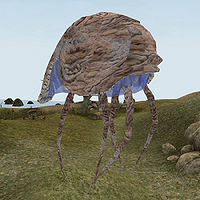 They are not hostile and can be found in the Sarvanni Molecrab Farm and on many coasts. Ancient half-human, half-octopus sea monsters commonly hunted for their skin (to make armor) and Dreugh Wax from their shells (for its magical properties). 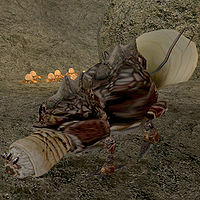 The wax found within their shells is highly valuable and useful if the player has a high alchemy skill. 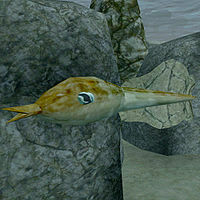 You will often encounter them in shallow water in caves and along the coastline. For a list of Dreugh defined in the standard game, see this page. 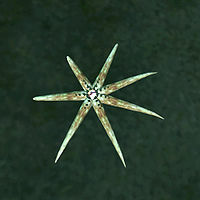 Eyestars share attributes with both plants and animals. They are immobile but can retaliate against unwary alchemists attempting to take their eyes. 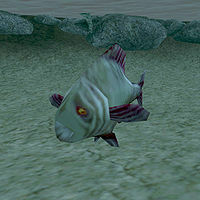 For a list of Fish defined in the standard game, see this page. 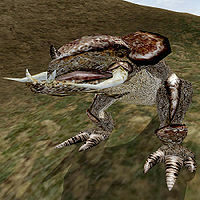 The primary domesticated herd animal of Morrowind. In general, the ones in the wild are aggressive, while others are not. 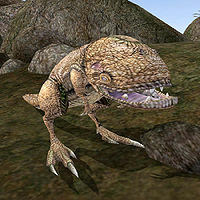 For a list of Guar defined in the standard game, see this page. A common animal with a stump tail. 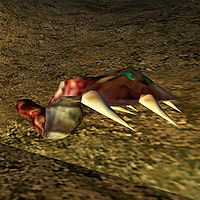 It has tusks although they are worthless for anything, with the possible exception of trophies, although removal of these is so difficult that it is almost entirely the province of fools to harvest them. The hide is used in alchemy. They are quite territorial and enter a state of heightened aggression during breeding season. For a list of Kagouti defined in the standard game, see this page. Kwama are insect-like creatures separated into several distinct categories. these categories are mostly self explanatory as they are named by function (for example Worker, Warrior). 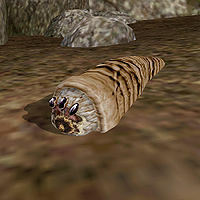 They produce Kwama Eggs which are "mined" in Egg Mines (mined and Egg Mine are actually misnomers, a better description being, harvested and Kwama Lairs as the eggs are not actually encased in anything which has to be gone through before reaching them and the tunnels are already dug). Kwama queens can become infected by blight diseases in which case they must be either killed or cured. For a list of Kwama defined in the standard game, see this page. 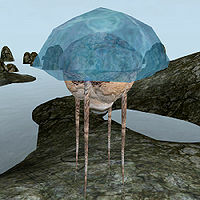 The Netch is an airborne creature similar in appearance to a jellyfish. Male, or Bull Netch, are poisonous but passive. Female, or Betty, Netch slightly more territorial, but less dangerous. Despite the Betty's more aggressive nature neither gender is particularly hostile. 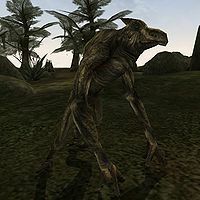 Netch can be found both in the wild and on Netch Farms, where they are slaughtered for Netch Leather, which is used for both alchemy and armor-making. For a list of Netch defined in the standard game, see this page. 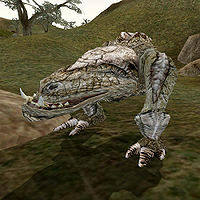 The Nix-Hound is a dog-like scavenger and/or mid-level predator. Despite certain similarities in body structure, however they are not named for their appearance but rather for their distinctive call. They travel in packs and are highly aggressive. While not generally a threat alone, a large pack can cause serious injuries even to experienced travelers. For a list of Nix-Hounds defined in the standard game, see this page. 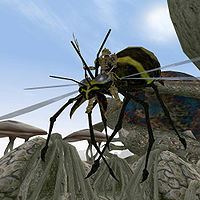 Sky Renders are large wasp-like insects that the Dres typically use as mounts. Note: The Sky Render pictured here is not the finalized design and will eventually be replaced with an entirely new design. 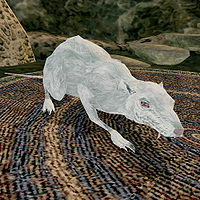 Rats and mice are common throughout Morrowind. 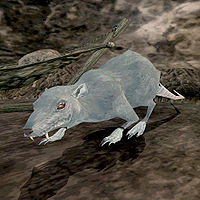 There are many types of vermin, mostly with only minor differences. 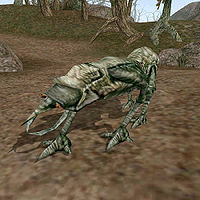 For a list of Vermin defined in the standard game, see this page. 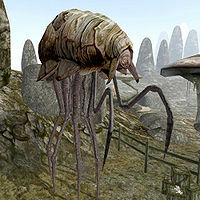 Long-Legged Velks are a type of domesticated creature kept by the native Dunmer. They use their long proboscis to extract nectar from flowers, which is then harvested from the creature's stomach to create a delicious sweet food ingredient. They are non-aggressive and more frequently found on farms or plantations rather than in the wild. 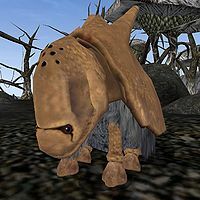 The Hoom is a domesticated herd animal found in the Velothi Mountains Region that is typically used by the Redoran. 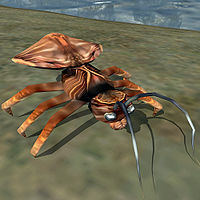 There are wild ones also found in the Velothi as well. While normally docile, a Hoom may become aggressive if it feels threatened and attack. The pipes on their backs make a horn-like noise, which can be tuned to make pleasing music. Currently, the only Hooms that have been placed ingame are only in TR_Preview.ESP and are located in the Uld Vraech Region. As for the primary TR_Data.ESM, they are in the file but not used yet. This page was last modified on 6 March 2019, at 08:31.